The nights are getting shorter, the weather more temperamental than Donald Trump during an immigration debate and frankly, the carefree, sun-and-beer soaked few months that is festival season seems like a long, long time ago. The alternative? Let's go urban. Founded as a classic bands-in-a-field sitch, Beacons Festival fast gained a name for itself as the ultimate hipster hangout, bringing the best in dance, alternative and inside to it's picturesque site in Skipton for some classic August merriment. That's not to say it didn't have it's fair share of issues - torrential rain, hurricane-level wind and the ever-increasing amount of musical competition certainly put the organisers to the test, to the extent that after just three years (four if you count 2011's cancellation), Beacons regrettably went the way that so many live events go these days. Luckily, just down the road from Skipton is Leeds, which more than proved it's capacity for the more modern festival - a citywide takeover of venues with some street food and workshops thrown in, and you have yourself a robust, nearly weatherproof model that allows a festival line-up to flourish. 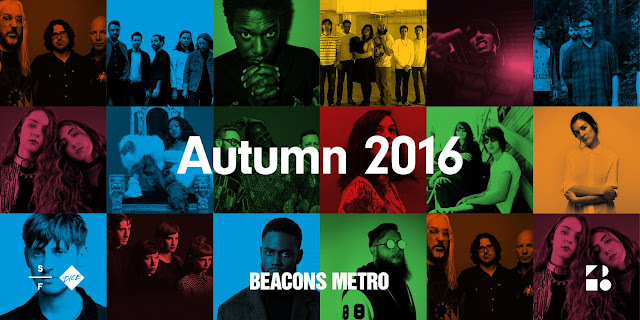 Following in the footsteps of Live At Leeds and Slam Dunk,we have Beacons Metro, a full season of the best buzz and established acts the current musical landscape has to offer. Now in it's second year, you can buy a season pass or individual tickets just like you would for any regular gig - no camping, no dodgy catering and absolutely no portaloos. Headline eyes might be on ex-NASTY crew member Ghetts, but our first Beacons Metro stop is all about Elf Kid. A quick spin of 'Golden Boy' will explain why - that Amerie sample ain't messing around. This gig will be the perfect way to open up a season of events that has a pleasantly large representation of grime, hip-hop and rnb, something severely lacking in Leeds until this point. This one will require a quick half-and-half dash from the Belgrave, but we can't imagine we'd want to miss one of Leed's favourite local bands in a seriously underrated venue. The acoustics of Holy Trinity should make for quite the sonic mix of a band who's pysch-rock is already highly layered. for all you logistics heads, it's also the closest venue to Leeds train station - perfect for the 200m sprint to catch the last train. Queen of Birmingham, Lady Leshurr is your new favourite forward-thinking rap artist, and a glorious alternative to the guns and hoes stereotype - she recently told NME that she doesn't swear in her songs as she wants to set an example. Fresh off the back of a huge Wiley collaboration (Where Are You Now? ), this'll be the last chance to see her in a venue this small for a while. Described by Resident Advisor as 'the new face of Grime', 19-year-old Novelist is just two EP's deep but has an enviable list of features that should see his set go off. Having quite XL to start his own label at the end of August, expect to be among the first to hear new tunes. An old favourite around these here parts, Local Natives have been missed since they last played in Leeds nearly 4 years ago. New record 'Sunlit Youth' has it's fair share of euphoric moments that we can't wait to see live...we'll be leading the chorus of 'Fountain Of Youth' with joyful abandon.